WPCandy tutorials – WPCandy has many useful tutorials that provide tips on configuring your blog. WordPress.org – Here you will find complete documentation for WordPress, including available plug-ins and themes and free downloads. As an open source project, WordPress depends on its community to develop plug-ins and themes, and to document each of these by using its Codex, a collection of blog pages which serve up wiki pages that members of the community can collaborate on. WordCamp NYC 2010 – The folks at WordPress organize “camps” at major cities throughout the year, and they are very interesting to attend. Cheap and highly recommended, if you are interested in WP. Brian Lamb and James Groom are working on an article for EDUCAUSE about “the state of public institutions, open edtech, and the fate of the free world.” They plan to showcase examples of how open source tools and “networked collaboration” shape various open ed projects. Five such projects at CUNY are highlighted below, and Brian and James will use this page as a resource for their article. At Macaulay Honors College, students are encouraged to create e-Portfolios to collect school work, reflect upon it, and “present it to a range of different audiences.” EPortfolios@Macaulay provides a way for students to creatively record what they have learned through blogs. Students can think of e-Portfolios as “museums” which contains artifacts of their thinking and learning, and they can invite others “to take a look.” Some rooms may be private, others exposed to the public. Macaulay has created a 30-second “commercial” to help students see the variety of uses to which these eportfolios can be put. Blogs at Baruch is “an on-line publishing platform platform” for the Baruch Community developed and maintain jointly by the Bernard L. Schwartz Communication Institute and the Baruch Computing and Technology Center. The site is based on WordPress MU. 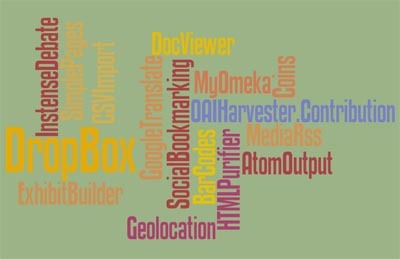 Here’s a partial list of projects on the system. Officially launched less than a year ago, the CUNY Academic Commons pulls together professors and graduate students from the 23 separate campus of the City University of New York (CUNY). Members can have individual blogs, join groups, share ideas on group forums, and collaborate on a wiki. There are currently over 1000 members. 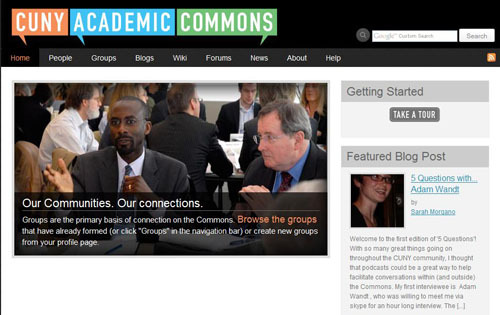 The Commons uses Buddy Press as its hub, with WordPress MU and MediaWiki as its spokes. Started in 2009, Looking for Whitman is a “multi-campus experiment in digital pedagogy” involving four separate schools: New York City College of Technology (CUNY), New York University, University of Mary Washington, and Rutgers University-Camden. 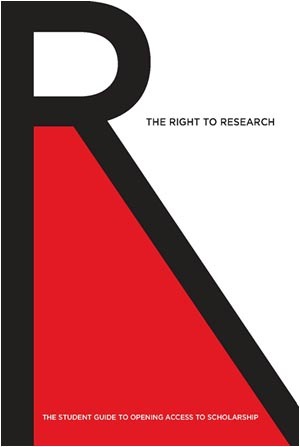 Funding was provided by the NEH Office of Digital Humanities. The site is set up using WordPress MU. 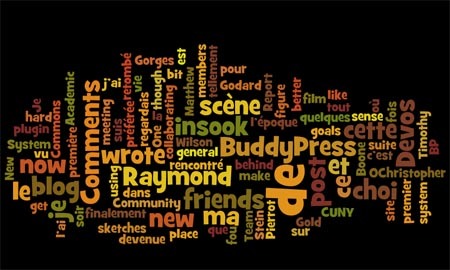 Wordle is a web-based tool that creates cloud-like images from text you feed into it. You can cut a block of text and paste it into Wordle’s interface, or just provide a url, and Wordle will generate a customizable cloud. You can choose colors, fonts, layouts, or just click on randomize until you find one that suits your needs. Tired of searching the Web for an appropriate image for your web page? Just wordle it! According the terms of service, you can capture the images from the screen and use them anywhere, as long as you cite Wordle as the source. Just do a screen print, and paste into photoshop, crop out the stuff you don’t want, adjust the size, save it as a image, and you are good to go. Blogs, Wikis, Podcasts, and Other Powerful Web Tools for Classrooms by Will Richardson, 2006, Corwin Press. This book provides a comprehensive explanation and is an outstanding pedagogical resource. WordPress a Better LMS The author discusses using a blog as an alternative to Blackboard or other Learning Management Systems.